NICCOLÓ PAGANINI (1782-1840): Le Streghe, M.S. 19, Non più mesta, M.S. 22 and I Palpiti, M.S. 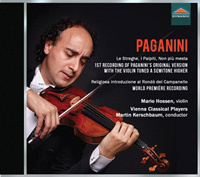 77 (all three are First Recordings of Paganini’s original versions), Religiosa introduzione al Rondò del Campanello, M.S. 67/1 (World Premiere Recording), Suonata con Variazioni, M.S. 47. Description: The first three items listed above are played a semitone higher, as Paganini intended, in D major, therefore sounding as if it were written in E flat major, which is the key of the orchestral accompaniment. The Religiosa introduzione, with men’s chorus in its first section, is the first version of Couvent du Mont St. Bernard, M.S. 67. Mario Hossein (violin), Men’s chorus of the Vienna Singverein, Vienna Classical Players; Mark Kerschbaum.